This book examines the development model that has driven China's economic success and looks at how it differs from the Washington Consensus. China’s Development Model (CDM) is examined with a view to answering a central question: given China’s peculiar matrix of a socialist party-state juxtaposed with economic internationalization and marketization, what are the underlying dynamics and the distinctive features of the economic and political/legal/social dimensions of the CDM, and how do we properly characterize their interrelations? 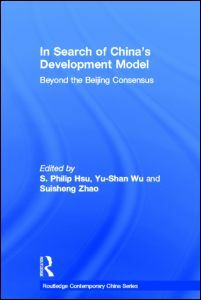 The chapters further analyse to what extent and under what circumstances is China's development model sustainable, and to what degree is it readily applicable to other developing countries. Based on their findings in this volume, the authors conclude that the defining feature of the CDM’s economic dimension is "Janus-faced state-led growth," and the political/legal/social dimension of the CDM is best characterized as "adaptive post-totalitarianism." The contributors illustrate that the CDM’s parameters are shown to be much less sustainable than the CDM’s outcome in developmental performance and the extent to which the CDM can be applied to other late-developers is subject to more qualifications than its sustainability. S. Philip Hsu is Executive Director at the Center for China Studies and Associate Professor of Political Science, College of Social Sciences, National Taiwan University. Yu-Shan Wu is director of the Institute of Political Science at Academia Sinica, Taiwan and jointly appointed professor at the Department of Political Science, National Taiwan University. Suisheng Zhao is Professor and Executive Director of the Center for China-US Cooperation at Graduate School of International Studies, University of Denver.